From the Cover: Being wealthy and beautiful doesn’t promise an automatic ticket for happiness. Sometimes you need the angelic touch of someone who needs you as much as you need him… Sometimes it’s hard to tell where one set of wings ends and the other begins. Claire is alluring, sensual – called an angel by some, though the woman she’s become is anything but celestial. Her heart is filled with pain so deeply embedded she doesn’t want to live any longer…until fate puts her into the hands of the most virtuous man she’s ever met; a man who needs someone like Claire to help him piece together the shattered bits of his own life. Tifferz Take- I was a lucky winner of Arms of an Angle! This would be my first book from Linda and will not be my last. This is a sweet romance that makes you feel good when you are done reading it. This had a great message to it and is super clean! Arms of an Angle is a fast paced novella, I hope you enjoy it as much as I did. It was a nice little escape from my day! 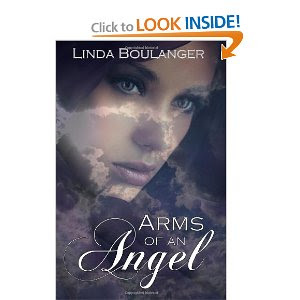 I am looking forward to my next Linda Boulanger book!